I guess the title is a little misleading. 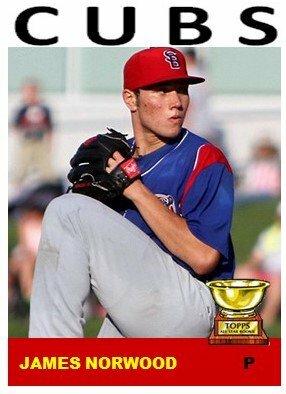 Not all the cards come from spring training, but they all were made during that time frame. 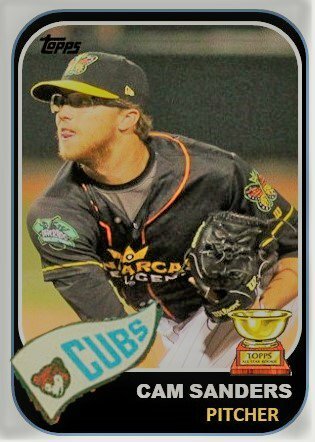 Culled from MiLB Pipeline, Stephanie Lynn, Rikk Carlson, the Eugene Emeralds, the Tennessee Smokies, the Pelicans, and Jordan Bastian, this collection really has a lot of color to it. Last year, I only had 44 cards from Spring Training. This year, a little over 80. The theme for this collection turned out to be color. After a very cold and very wet winter in northern Illinois, I was ready for the bright colors of baseball in the spring. I love this card. 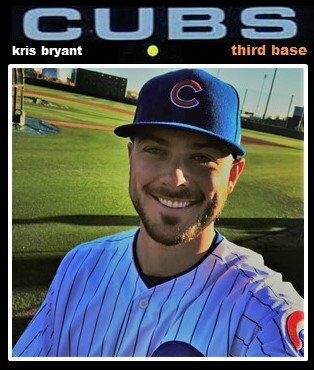 The Kris Bryant card comes from Jordan Bastian of MLB.com who let Kris Bryant have his camera for a few moments to grab this candid shot. 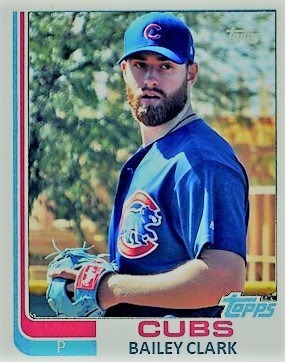 At some point last year, I grabbed this shot of Oscar in his Smokies alternate jersey that almost comes alive against the black template of my favorite card of my youth, the 1971. The wide angle shot fits perfectly in a template I usually associate with a Thurman Munson All-Star rookie card. Relievers often get the shaft when it comes to pics. Usually, it the closer who gets all the glory. 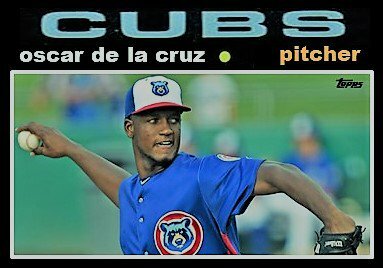 In this case, I finally found a pic from the South Bend Cubs of James Norwood 3+ years after he pitched for them. I really like how the blue and red come out in the 1964 card. 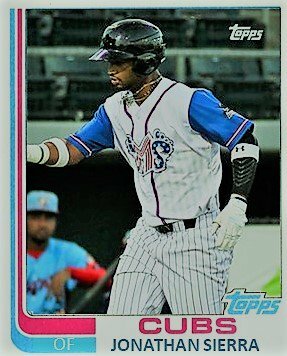 Published by MiLB Pipeline, there’s an intensity here that I really enjoy in the card. Nico looks bound and determined to do something, and he did all spring. I went back through Eugene’s Facebook account to see if there were anymore pics I could find that would make a good card. And here was this beauty of Sanders in full extension. I am excited to see what he can do as a starter this year. He has such a smooth delivery. Red naturally stands out in a card, sometimes too much. 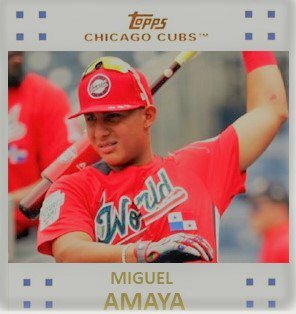 However, this red jersey that Miguel wore in the Futures Game just comes alive in this shot from MLB Pipeline. This shot by the Eugene Emeralds is all about Sierra’s 4th of July jersey meshing perfectly with the 1982 frame. It doesn’t get much better than this color scheme match. Gold on gold. 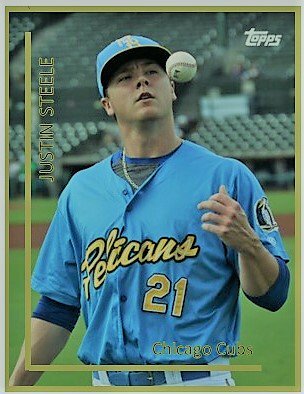 The 2001 template is a perfect complement to the yellow hues of Steele in a Pelicans’ jersey. The picture was published by the Pelicans. 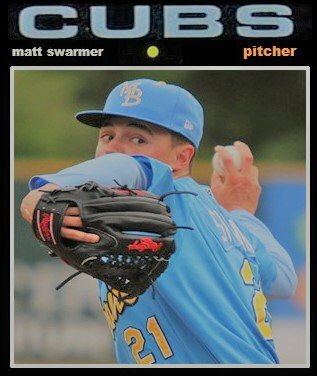 The big righty looks to be pretty sneaky in this Pelicans’ picture capturing Swarmer in mid-delivery as he gets set to complete the pitch. Sometimes the jersey makes the card. Sometimes, it’s how the subject blends with the background. 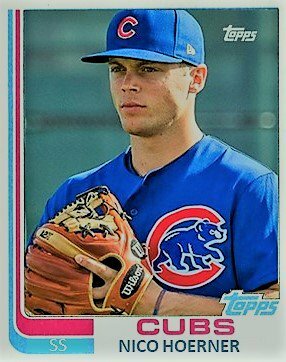 In this shot of Bailey Clark from spring training, Stephanie Lynn of Cubs Den gets some green, some gold, and some blue that really make Bailey Clark stand out, even with his face somewhat in shadows. As for Yu Darvish, Rikk Carlson grabbed this excellent dugout shot of Yu in his spring training debut. Normally, I don’t include MLB cards in the top 10. 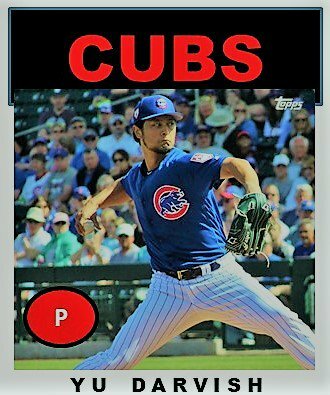 But Rikk’s shot of Yu is almost perfect in color, background, and action! Put in a 1986 template just made the picture stand out even more. I really dig the mix of sunlight and shadows throughout Yu’s jersey! It’s a brilliant meld! Next ›Kyle Hendricks Gets an Extension!